If you gave given a presentation using a laptop, you probably have — or should have — a remote, so that you don’t have to be tied to your laptop to forward the slides. I use a small Targus presenter remote and I like it very much. I lost it for a while (thankfully, I’ve found it), but I started looking for a new one and realized that my old one is no longer available. I’d love to hear which presenter you use, and why. Please leave a comment so others can benefit from your experience. This excerpt is shared with permission from ellenfinkelstein.com. 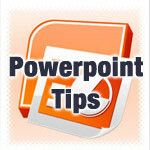 PowerPoint Tips Microsoft powerpoint, powerpoint, presentation remote control. permalink.